What a roller coaster ride I’m on! My son Trevor has been profoundly affected by Autism since just over a year old. This last year I’ve watched as Autism has tightened its grasp on him. I am fighting everyday to loosen that hold it has. It’s a constant battle. One that brings me to my knees, bringing an ache to my heart like nothing else. During this same time period I’ve achieved great personal success with my art. While I’ve been printmaking ever since attending and graduating from the University of the Arts in Philadelphia back in 1990 it is only more recently that my work has been so well received. I believe the reason for this is because I needed my art now more than ever. I need something that has everything to do with me and that I have complete control over. My art has saved me while I’m helping to save my son. Just found out I’ve been published in the March/April 2010 edition of Somerset Studio Magazine. It’s only available to subscribers right now but will hit the bookshelves in a little over a week! 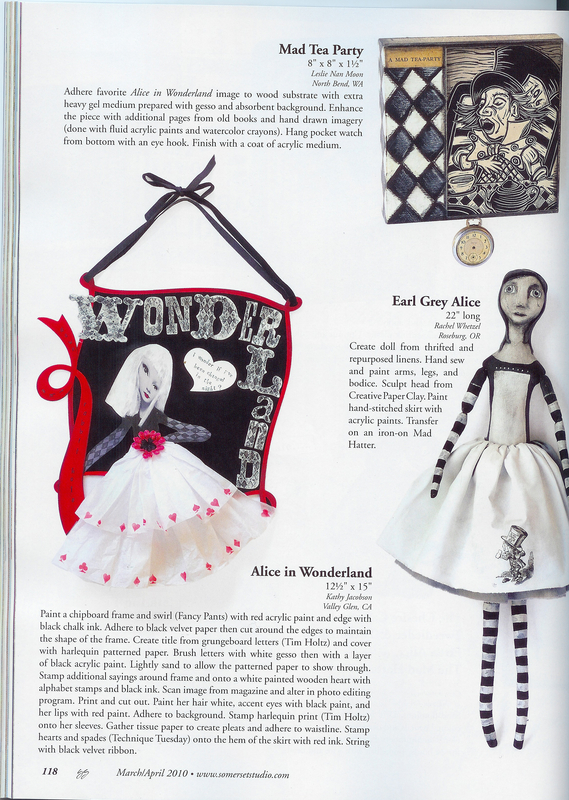 My “Mad Tea Party” is featured in their Alice in Wonderland Call to Artists. Additionally, I am being photographed with my work next week at ‘has’ (Kirkland Art Center’s Retail Store) by 425 Magazine. I will post more information on that when I have it. Lastly, only about 6 weeks until my solo show at Gary Manuel Salon in Seattle’s Belltown district. Opening will be during Belltown’s Art Walk (2nd Friday of each month). You are currently browsing the Lesliemoon's Blog blog archives for February, 2010.